"This is a very filling, easy to make manicotti dish my whole family loves - including my picky 2 year old! It's a combination of a few different recipes. Great served with tossed salad and crusty French bread." Place ground beef, onion and garlic in a large, deep skillet. Cook over medium high heat until beef is evenly brown. Remove from heat. Mix in bread crumbs, Italian seasoning, egg and 1 cup shredded cheese. Spoon filling into manicotti shells. Combine tomato sauce, stewed tomatoes, wine and mushrooms. Spoon sauce to cover the bottom of an 8x11 inch baking dish. 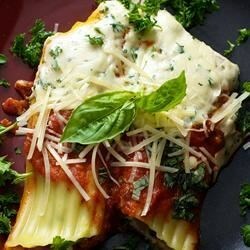 Arrange filled manicotti in a single layer, and cover with remaining sauce. Sprinkle top with remaining cheese. Cover, and bake in preheated oven for 30 minutes. Remove cover, and bake 10 minutes. See how to make something deliciously different with leftover turkey. May be assembled up to 24 hours ahead of time, and baked an additional 15 to 20 minutes while covered, to heat through. I made this for my son's tenth birthday party. The kids gave it rave reviews! My family thinks it's great! I always enjoy making these. I double the beef as others suggested. This recipe was great, we customized with our own homemade spaghetti sauce instead of can. It was an all around geat recipe, definitely will try again. My husband and daughter loved it! I made double the filling, and froze the rest to use later. Worked out great! !